Designed to actuate by changes in the pressure of a liquid or gas, furnace pressure switches are programmed to activate at certain pressure points, and may be designed to make contact either on pressure rise or on pressure fall. Furnace pressure switches are produced by pressure switch manufacturers to operate in furnaces as safety devices through offering control stability through inconsistent conditions and assuring continuous service under extreme shock and vibration. They typically work with gas or liquid pressure situations, individually or in a combination. Common industries that utilize furnace pressure switches include pulp and paper residential, industrial, food processing, heating and cooling, electronics, foundry. Furnace pressure switches are used for applications such as residential boilers or furnaces, waste oil heating systems, small air compressors, electric or gas heaters, pumps, food processing equipment and electric strip heaters in VAV systems. Furnace pressure switches typically consist of an elastomeric diaphragm, insulators and field adjustable pressure set points. 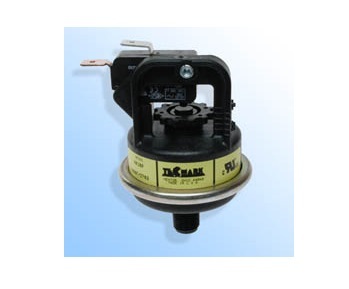 When a furnace pressure switch is actuated an elastomeric diaphragm moves and opens or closes an electrical circuit that interrupts or continues the flow involved. An elastomeric diaphragm eliminates the need for an oil barrier because they separate pressure instruments from the process media, while allowing the instruments to sense the process pressure. The insulators are designed as a protective barrier against direct exposure to live parts. A furnace pressure switch is set to a certain point of pressure to which it will automatically respond. Field adjustable pressure set points allow the furnace pressure switch to be calibrated to the correct pressure points for opening and closing the diaphragm. There are three main types of furnace pressure switches: air pressure switches, water pressure switches and fuel pressure switches. An air pressure switch ensures that there is enough fresh air circulated through the furnace. A water pressure switch is used in furnaces that heat water and protect the water heater tank from burns. A fuel pressure switch monitors the pump’s ability to produce enough pressure for the liquid fuel oil to be squeezed into a fine mist through a nozzle for full combustion. Furnace Pressure Switches A furnace pressure switch is an interlock device that senses changes in hydraulic or pneumatic input pressure and responds by making electrical contact, switching on or off.